Arsenal want Ajax defender to replace Nacho Monreal? 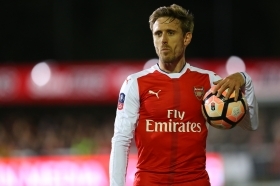 Arsenal are reportedly looking into a replacement for Spanish left-back Nacho Monreal amid his regular injury concerns over the past year or so. The Gunners were forced to play with right-back Stephan Lichtsteiner out of position against Leicester City on Monday night after Monreal and Sead Kolasinac had sidelined minor injuries. According to Calciomercato, Unai Emery is said to consider the left-back position an area of concern amid Monreal's occasion struggles with fitness and he is prepared to pursue a new recruit at the turn of the year. It is added that Ajax's Nicolas Tagliafico is the leading candidate on their shortlist with the club's scouts having watched him in close quarters playing in the Eredivisie. The Argentine, who recently featured at the World Cup, only joined Ajax at the turn of the year and the Dutch side would surely command a significant fee if they are to part ways with their prized asset in the near future.